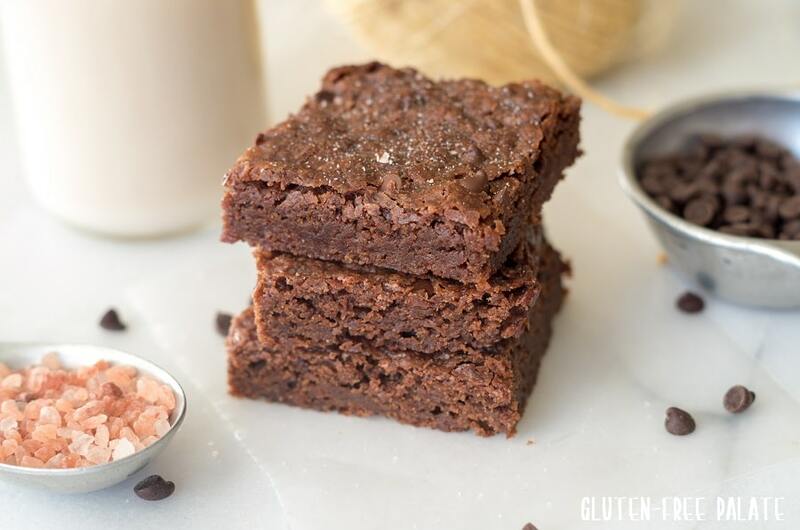 Gluten-Free Vegan Brownies that are free from the top allergens, rich, and fudgey. This Gluten-Free Vegan Brownie recipe is super simple to make, and uses regular ingredients found in most kitchens. My family likes to share recipes from generation to generation. These Gluten-Free, Vegan Brownies are an extension of that tradition, with an allergy-friendly twist. Enjoy Life Foods just launch a new campaign called Generations of Inspiration where they are asking the community to share what their family-favorite desserts are. 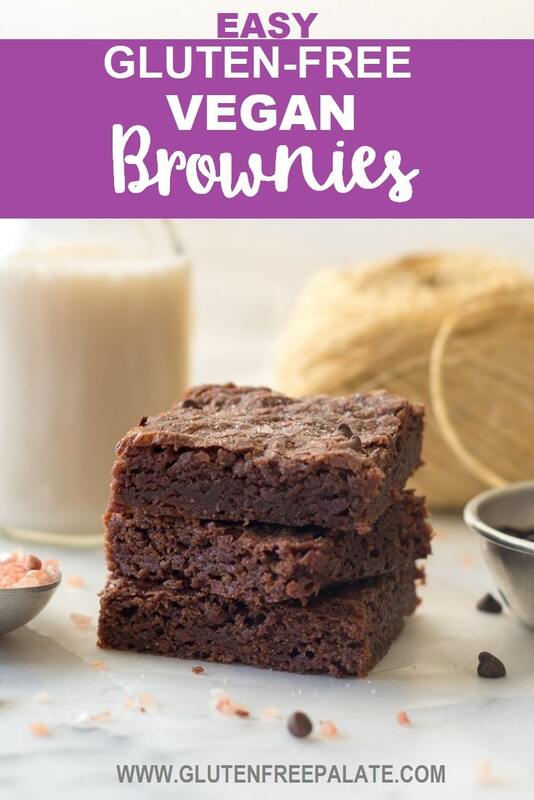 This brownie recipe is our family-favorite, passed down from my great grandmother, and originally started with butter, eggs, and a glutinous flour. I’ve transformed this recipe using simple substitutions and have been able to recreate this family classic into a treat that we can all enjoy. One of the things that we struggled with when we found out that we had to remove gluten, dairy, and peanuts from our house was not being able to enjoy the family recipes passed down to us. It took me years to figure out how to convert recipes, like these Gluten-Free Vegan Brownies, into a dish that we could all enjoy. The good news is that these gluten-free vegan brownies are incredible, and you won’t miss the butter, eggs, and gluten. The bad news is that they are so good, that you won’t want to share. 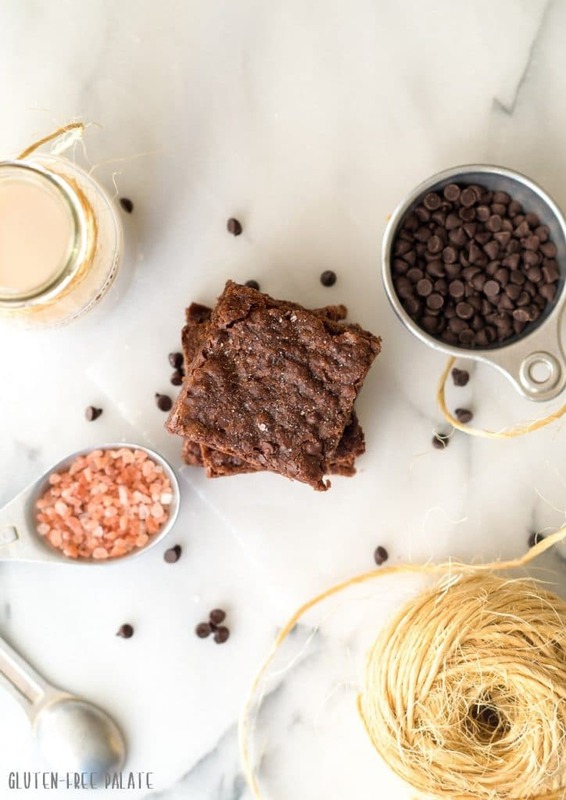 Add some crushed candy canes or sprinkle these gluten-free vegan brownies with sea salt for an extra special treat. Food has always been a big part of our family. From pot lucks, to parties, and several family members going to culinary school – you could say that a lot of our traditions revolve around delicious dishes. These Gluten-Free Vegan brownies are the most recent family recipe transformation. 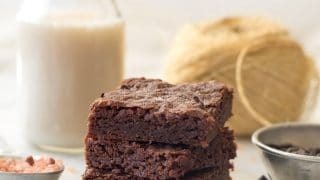 I absolutely loved sitting down at the table with my dear husband and our two sweet girls with a plate of these Gluten-Free Vegan Brownies, and a tall, cold glass of dairy-free milk. This is a recipe that I hope my girls will pass on to their children. Preheat oven to 350°F (180°C). Position oven rack in the center of oven. Line a 8″x8″x2″ pan with parchment paper; set aside. Stirring frequently, melt dairy-free butter and chocolate morsels in a medium saucepan over low heat. Once melted, remove from the heat and stir in sugar, flax eggs, and vanilla. If desired, sprinkle additional baking morsels over the top. Bake from 30 minutes or until the center is set. Remove from oven and cool in the pan on a wire rack. Once cool, pull brownies out by the parchment paper and cut into bars. 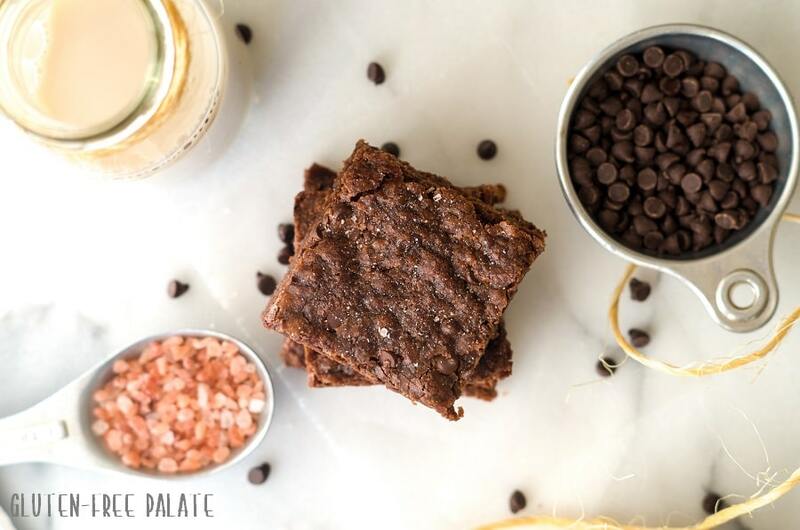 See how easy these gluten-free vegan brownies are to make? I hope you like them as much as we do. 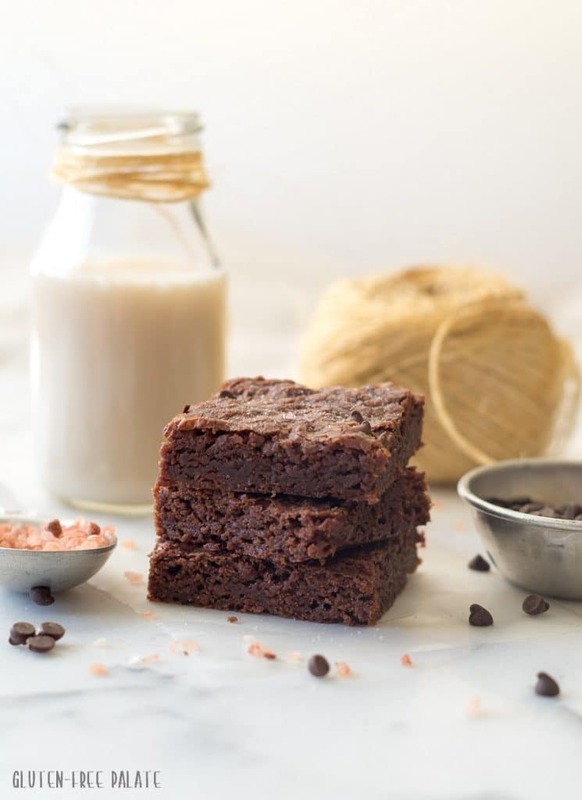 The richness of these brownies comes from the combination of ingredients but starts with the smooth, chocolatey baking morsels from Enjoy Life Foods. Using an allergy friendly baking chocolate not only pulls the recipe together, it also helps create the crinkled top and fudgey center. I hope you enjoy these Gluten-Free Vegan Brownies as much as we do. Looking for other yummy chocolaty treats? My Gluten-Free Vegan Ganache Cake is a reader favorite. If you’re looking for more allergy friendly sweet treats you are going to swoon over this Gluten-Free Brownie Trifle from My-Gluten-Free Kitchen. Not in the mood to bake? These top 8 allergen free Chocolate No Bake Cookies from Alisa at Go Dairy Free are for you. Gluten-Free, Vegan Brownies that are free from the top allergens, rich, and fudgey. How can you say no to a delicious brownie? I love brownies but being able to SHARE them with family is the best! Love. Pinned. Sharing! Love your recipes. I have made your chocolate chip muffins and kids loved them and I happy that it has all healthy ingredients. Would like to try your chocolate cake donut and this browny. But can I substitue maple syrup or honey for sugar? Thx! Ok, these things are addicting! Thanks for the new vice. We checked out the book “If you give a mouse a brownie” from the library. We had to make brownies together after that! Googled for a recipe that my allergy boy could eat and yours popped up. We had everything already so gave it a go! In the oven now. Smelling yummy! I didn’t realize they had a brownie version of “give a mouse a” books. So fun! Let me know how the brownies turn out.